Toronto’s real estate market appears as though its going in the direction that one day soon only the ‘super rich’ high net worth individuals are going to be able to afford a home anymore but the reality is that with interest rates being as low as they are it keeps the door open for us paupers too. Buying a home in Toronto is still achievable for many. HGTV wrote a fun and informative article listings some of the most affluent neighbourhoods in Canada. Calgary takes a number of spots, but whether they can hold onto them because of their economy, loss of jobs and downturn in their real estate market remains to be seen. Not to be overlooked, there are even a couple of a neighbourhoods in Winnipeg on the list. Of course, the truly wealthy are in a league of their own. 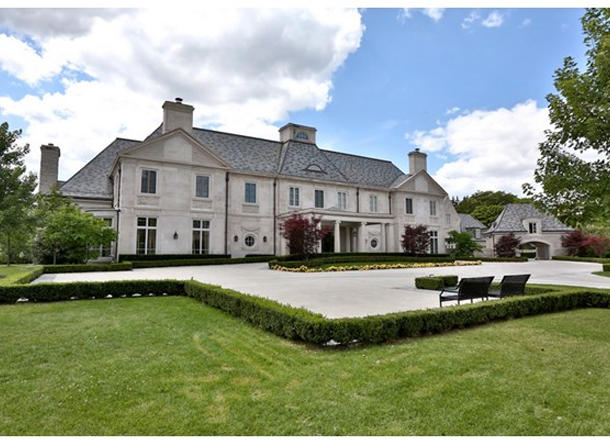 Toronto’s Bridle Path ranked #1 on the list and with the average net worth of residents in this community being an astounding $22.27M, it’s no surprise that some of the homes there will blow you’re mind! What’s interestling though is that the average annual income is ONLY $936,137, which seems odd except that the average house price clocks in at a reasonable $2.24M. Honestly though, that number seems low to me. I realize there are always the sensational and media hyped anomalies like Conrad Black’s home, which was listed for $22M, or the featured ten bedroom home which is $28.8M that make the news, but it would seem to me that an average price of 2.2M seems not quite realistic for that ‘hood. The #2 neighbourhood is York Mills-Windfields with an average networth of $21.55M and an average income over $1.2M. As an aside, I must say, this neighbourhood is close to my heart. I grew up at York Mills and Bayview and I can remember in 1991 trying to sell my family home. As a young 20 something, I had just got my real estate license and I was ready to tackle my biggest listing at that time. Well I’ll tell you, it was a real challenge. We could barely give that house away. Of course at the time, the market was struggling after the late ’80’s crash and we were lucky to sell it for around 500K. At that time it was below what other homes were selling for in that part of North York. To add insult to injury, I just saw that our home sold again for a whopping $2,700,000!!! Times have changed. #3 is also in Toronto! Sunnybrook, with an average networth of $20M but the average home price is $2.9M but the average income isn’t even $312,000! Toronto also takes sixth place (Forest Hill South and UCC) #8 (Lawrence Park North).